Led by team owners Bob and Mindy Rich, the Buffalo Bisons have extended their adoption of the City of Buffalo High School Baseball Program for a fourth season in 2010. The adoption will include 14 high schools –with the recent additions of Buffalo Early Middle College and Vocational and Performing Arts High School- and the continuation of the “Junior Bisons” summer team. 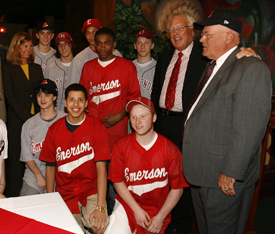 The Rich Foundation and the Buffalo Bisons officially adopted the City of Buffalo High School Baseball Program in April of 2007 as a commitment to assist in the revival and development of the city’s high school program. In the four years since, the Bisons have facilitated and assisted in the funding of the renovation of Johnnie B. Wiley Stadium, provided stipends for each school to hire assistant coaches and purchased extensive baseball equipment for schools that lacked even basic supplies. The Bisons have also invited teams to use the faculties located at Coca-Cola Field, including the team’s indoor batting cages. Each year, the Bisons coaches and players have held one-day clinics for both the coaches and players of Buffalo high school teams. One of the highlights of this adoption is the Junior Bisons. Each year, around 18 players are selected from the 14 Buffalo public high schools for a team that competes in the scholastic division of the CEBA -the County of Erie Baseball Association. The team has made the post season in each of the past two seasons. Two former Junior Bisons are currently playing baseball at the collegiate level. With the growing interest this adoption has created, the Bisons have also found it necessary to be active in Buffalo middle schools as well. In 2008, the Bisons assisted in the forming of the Buffalo Middle School Developmental Fall Baseball Program where three to four teams (60 total students) are formed from area seventh and eighth grade students. The season is run at no-cost to the players and is the first of its kind in the city of Buffalo. This league focuses on skill development, sportsmanship and team building. 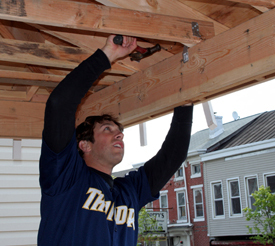 Seven players for the Trenton Thunder, the Double-A Affiliate of the New York Yankees, volunteered at a Habitat for Humanity home build in East Trenton this morning. 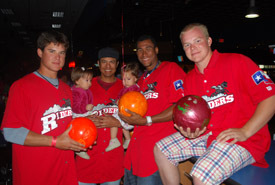 The players who took part in the event were: RHP Grant Duff, RHP Eric Wordekemper, RHP Ryan Pope, RHP David Phelps, RHP D.J. Mitchell, OF Austin Krum and IF Justin Snyder. 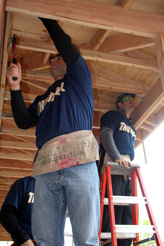 The players worked on a duplex that has been under construction since March 2009. They helped put the “finishing touches” on the home including the installation of lattace to the back porch and working on the ceiling of the front porch. One of the homes is expected to be completed and turned over to the new owners on Friday, April 30. The Thunder front office staff spent December 2, 2009 at the same location installing sheet rock and siding. Once again this season Mondays at Arvest Ballpark will feature our popular community outreach initiative called “Pack the Park For Charity” as several different non-profit service agencies will enjoy the opportunity to raise funds and awareness for their specific cause. Each non-profit organization will generate revenue through the sale of discounted Naturals tickets for their specific game. This season the program will extend to Wednesday night games during the summer. The selected charities will sell six dollar reserved tickets to a Naturals Monday or Wednesday home game, with a different major charity pre-selected for each Monday or Wednesday. The normal reserved ticket price is eight dollars. Three dollars per ticket sold will be given back to the charity. Supporters of the particular charity can also order tickets online or at the ticket window with a special unique codeword supplied to the charity to facilitate such sales. The more people “in the house” at Arvest Ballpark each Monday or Wednesday – the more revenue generated for the worthwhile cause. Each week’s Pack the Park Charity partner will also appear on the Jay and Brock Show on Hot Mix 101.9 the week prior to their date and some may also appear on KNWA News to raise awareness for their cause. To purchase tickets supporting these charities for their respective nights, please contact the charity using the contact information listed above. For more information about Pack the Park for Charities, please contact Amanda Potter with the Naturals at 927-4900. 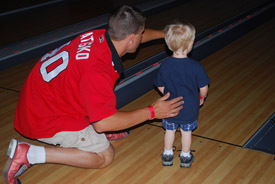 On April 19, 2010, children at Carolinas Medical Center Levine Children’s Hospital were treated with a visit from several Charlotte Knight’s ballplayers. The monthly visits are a part of the Knights ongoing outreach in the Charlotte and area community. Levine’s 234-bed children’s hospital combines the medical expertise the community already relies on with a spectacular new state-of-the-art facility designed to care for the physical and emotional needs of children and their families. The Knights’ players, personnel, and mascots make regular visits to the hospital to help provide hope, joy and fun activities for Levine’s patients and families. Besides making their monthly visits, players and personnel of the Charlotte Knights also keep in touch with several of Levine’s patients via e-mail and online communities such as Facebook. 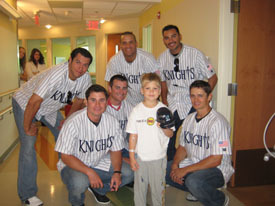 Charlotte Knights Wes Whisler, Adam Ricks, Daniel Hudson, Erick Threets, Jeff Marquez and Brent Lillibridge visit with 6 year old Ben Aguallo. This picture was posted on Facebook by the Aguallo family immediately following the visit. The caption read: "One of Ben's highlights...... meeting Pro Baseball Players... thank you Charlotte Knights!" The Wisconsin Timber Rattlers, with the help of a rehab start by Milwaukee Brewers’ pitcher, Jeff Suppan, collected 480 pounds of non-perishable food items last Friday, the official start to the 2010 season. The Timber Rattlers announced the “Bring Your Soup On in for Suppan” food drive to benefit St. Joseph’s Food Program shortly after they received official word that Jeff Suppan would be heading to Appleton to start the home opener on Friday, April 9. The news quickly spread about the promotion in which fans who presented a non-perishable food item would receive a half price ticket to Opening Night. The canned goods piled up in the box office and added up to a total donation of 480 pounds from the 2,268 tickets sold. The food was delivered to the pantry Monday morning. The Timber Rattlers and St. Joe’s thank all of the fans who donated to the food drive. The BlueClaws, OceanFirst Foundation, 92.7 WOBM and 1160 WOBM-AM are happy to announce the 2010 recipient charities for this season’s “Home Runs for Heroes” program. This will be the program’s second season. Last year, OceanFirst donated $24,000 to local charities that provide essential support to veterans and active members of the United States military after every BlueClaws home run at FirstEnergy Park. This season’s recipients are the American Red Cross, American Recreational Military Services (ARMS), Army Emergency Relief (Fort Dix), Army Emergency Relief (Fort Monmouth), Navy-Marine Corps Relief Society (Earle), Navy-Marine Corps Relief (Lakehurst), Catholic Charities Diocese of Trenton, National Guard State Family Readiness Council and Vetgroup. Like last year, the program will tie each position on the field (not including pitcher, but including designated hitter) with one of the randomly selected participant charities. Each home run by the BlueClaws at home this year will bring a $1,000 donation to the corresponding charity courtesy of OceanFirst Foundation. In addition to the grant money received, each organization will receive publicity at the ballpark and on WOBM AM and FM. Results will be updated throughout the year on BlueClaws.com, OceanFirstFdn.org, Wobm.com, BlueClaws radio broadcasts and during all BlueClaws home games at FirstEnergy Park. All charities will have a representative interviewed on the Ocean County Breakfast Show by Shawn Michaels and Sue Moll on 92.7 WOBM. Founded in 1996, OceanFirst Foundation is the first foundation in the country to be established by a bank as part of an initial public offering. OceanFirst’s contributions to local charities continue to grow. In 2009, OceanFirst Foundation donated more than $1.2 million to community initiatives. OceanFirst Foundation has contributed approximately $20 million to over 600 local charities in Ocean, Monmouth and Middlesex counties since its inception. Its four priorities include Housing, Health and Wellness, Improving the Quality of Life, and Youth Development. The Lookouts have partnered with SunTrust Bank to introduce “SunTrust Sundays” to benefit the Chattanooga Area Food Bank at AT&T Field this season. For every Sunday game this season, with the exception of July 4th, fans are encouraged to bring canned food items to AT&T Field to put in the bed of the Lookout’s Dodger Blue antique truck parked outside the stadium. On SunTrust Sundays, each fan that donates food items will receive a free general admission ticket for that Sunday’s game. Tickets will be distributed on a “per person” basis and are subject to availability. The canned food items will be donated to the Chattanooga Area Food Bank. “We are excited to partner with SunTrust to help the Chattanooga Food Bank, and utilize this opportunity to help our community, too.” said Lookouts Owner/President/General Manager Frank Burke. The Chattanooga Food Bank, whose mission is to feed the hungry by linking America’s food bounty with those in need, distributed nearly 8.8 million pounds of food to more than 125,000 families in need last year.